On behalf of all at Living Hope, we would like to thank The Rotary Foundation of Rotary International for the incredible honour they have given to our founder and chairman, John V Thomas, in presenting him with the ‘Paul Harris Fellow Award’. We are thrilled by this recognition of John’s vision, hard work and compassion for the poor and needy in establishing and running Living Hope. 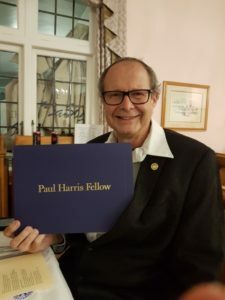 As John is not a Rotarian, it made the award all the more significant for John as this is Rotary’s highest award, generally only given to Rotarians who have made a significant and tangible impact on society. This award came as a complete surprise to John, as he had no idea why he had been invited to the Cape of Good Hope Rotary Club meeting. This last Saturday was Living Hope’s AGM where it was revealed that in our last financial year we reached 110,151 people. This is the enormous impact which Living Hope is making under John’s leadership in the communities around us. We are continually amazed at what God has done through Living Hope and the recognition it receives from its partners and supporters both locally and around the world. All glory to God. Congratulations Pastor John, we are proud to serve alongside you! We are so grateful to those who donate their time, funds and give of their resourses to us in order to help us carry on the work we do, Bringing Hope and Breaking the Despair of Povery, Diseases and Addiction. We have seen young donors, 12 years old, use their voice and influence to fundraise for Sanitary Pads for our teens clubs, others have seen our wish list items and gathers work friends together to help fundraise for a specific need. Will you help us? Will you have a look at our wish list and see if there was something your company, friends or even a family memeber in business may be able to help us with obtaining. Thank you to those who have given, we appreciate you. You’re a Mom, you care! Join us for a special time celebrating Mothers this Mothers Day! 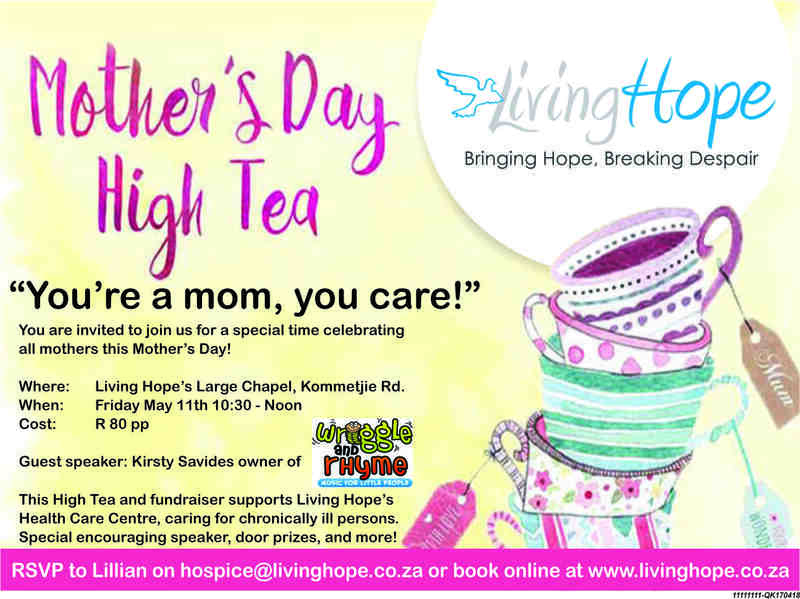 This Tea and fundraiser supports Living Hope’s Health Care Centre, who care for chronically ill persons. We will be having a Guest Speaker, prizes and more! Living Hope serves several hundred TB clients on an ongoing basis in the areas in which it works from Military Road south all the way to Cape Point. TB knows no boundaries, does not respect one’s status in a community, or whether one is rich or poor. If one’s immune system is weak, there is a risk of getting TB. Tuberculosis is an airborne infectious disease caused by a bacterial infection – Mycobacterium tuberculosis (MTb). TB most commonly affects the lungs but can affect any organ in the body. Someone with TB can spread the infection to others simply by coughing or sneezing. Symptoms of tuberculosis include coughing for 2 weeks or more, coughing up blood, night sweats, weight loss and exhaustion. If you have one or more of the symptoms you must go to a local clinic and ask for a TB test. This is usually done by having a sputum test. TB can be treated and cured if clients complete the entire treatment, but unfortunately about 40% of TB patients go undiagnosed and they continue to spread the disease. TB patients are treated with several different medications for at least six months, and some struggle with serious side effects. For multidrug-resistant TB (MDR-TB), treatment lasts 1-2 years, (although new treatment is now available which is a 9 month course of medication) with painful injections and drugs that can cause side effects. A person being treated for MDR-TB typically needs up to 14,600 pills and 460 injections. Treatment is even harder on extensively drug-resistant TB (XDR-TB) patients and the success rate is even lower. The negative economic impact of TB can be devastating for individuals, families and communities, especially when the household earner has MDR TB and is unable to work for months, making it very difficult to care for their families and especially children. Living Hope would appreciate any donation of non-perishable foods to assist those presently on TB treatment. 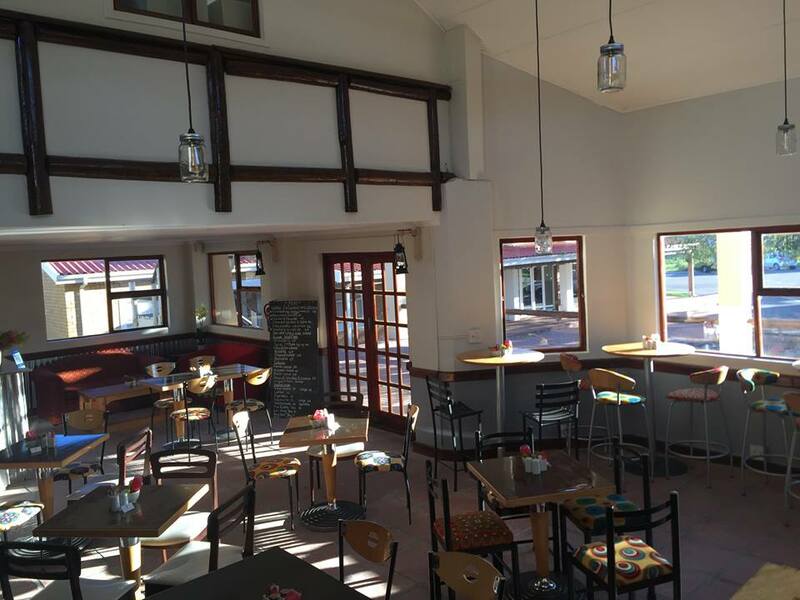 You can calll Living Hope on 021-784 2800. Help prevent the spread of TB by ensuring public spaces and transport are well ventilated, cough into your shoulder and not into the air, sneeze into a tissue and dispose of it, do not spit on the ground. Children can get TB but do not pass it on. If anyone under 5 years of age has been in contact with someone with TB they should visit their local clinic and be tested as soon as possible, as should anyone who has a compromised immune system and develops symptoms. 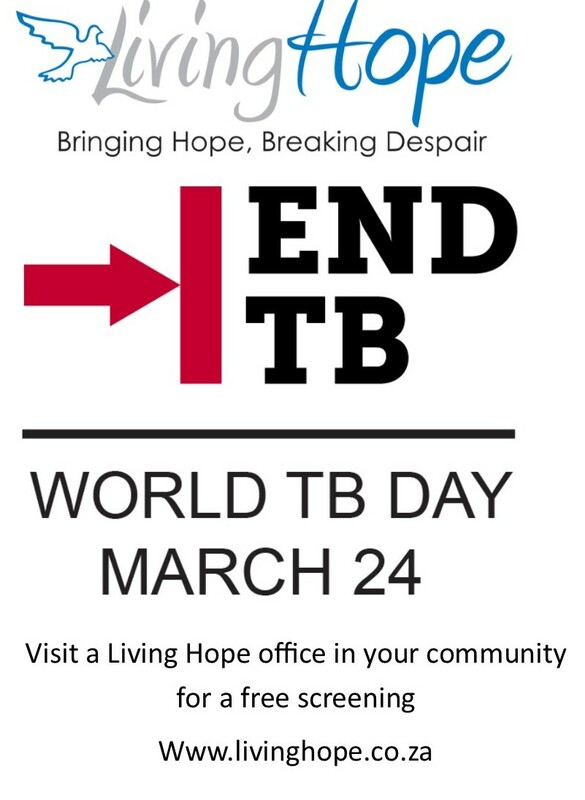 If more information on TB is desired, do not hesitate to contact Living Hope. Do you shop on Amazon, did you know that every item available for purchase on www.amazon.com is also available on AmazonSmile (smile.amazon.com) at the same price. You will see eligible products marked “Eligible for AmazonSmile donation” on their product detail pages. From 12 – 31 March, Amazon is tripling the donation amount to 1.5% when customers make their first eligible smile.amazon.com purchase from March 12 – 31, you shop as per normal and Living Hope benifits, here is the link, smile.amazon.com/ch/20-1248641. 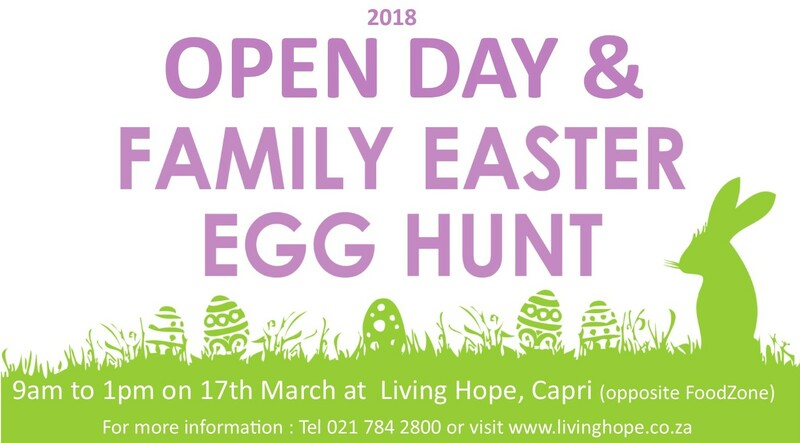 Living Hope is having our Annual Open Day on 17th March from 9am to 1pm. There will be a host of other activities such as Jumping Castles, Facepainting, Food Stalls, Tours and information tables on the various programmes we run in the communities. 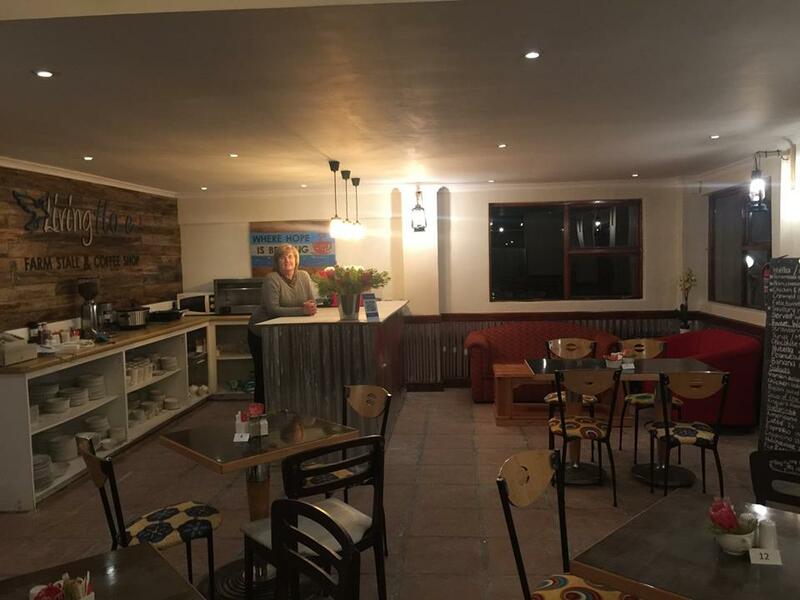 If you find yourself battleing with substance abuse, reach out to us on 021 788 9702 or visit our offices in Muizenberg on the main road next to the train station. There is help, you are not alone. 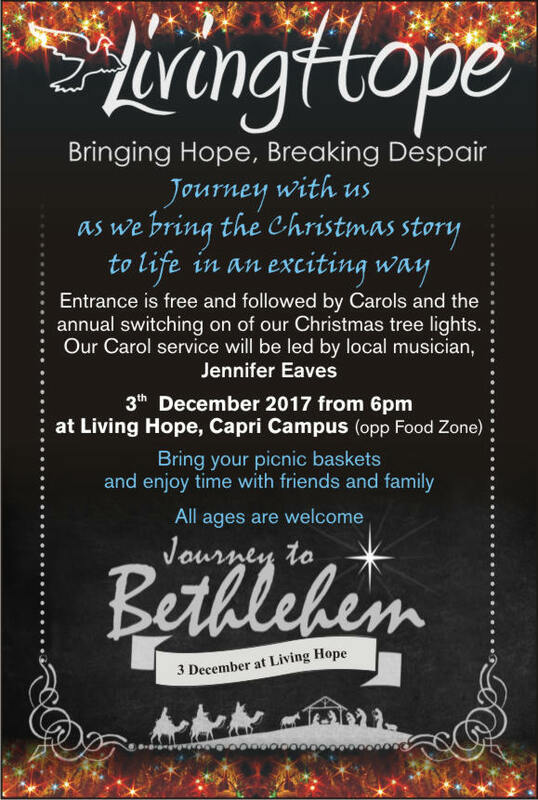 Journey with us as we bring the Christmas story to life and enjoy a evening of traditional Christmas Carols with well known local artist Jennifer Eaves and the James’s at Living Hope’s Capri Campus on the 3th December. All ages are welcome and bring a picnic basket and blanket to share with your family. 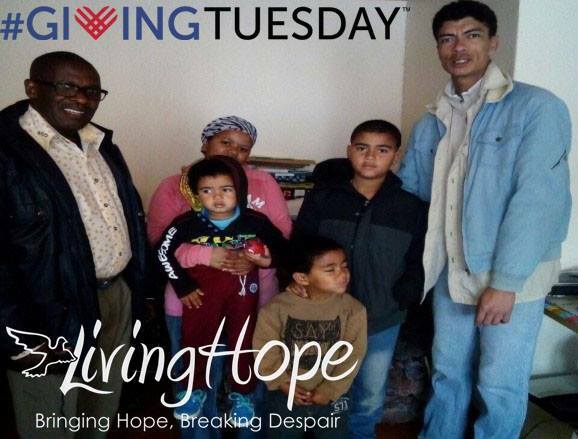 Living Hope is participating in this years #GivingTuesday campaign which is happening worldwide on 28 November. We have set a goal of $48 320, which is the number of individuals we reached in our last financial year. Thats $1 per person. During the year, we reach and serve those in our communities and do not charge for health, empowerment, drug and alcohol recovery or lifeskills. This means we have to fundraise in order to carry on the programmes we run. Will you get involved and help us reach our goal? We are embarking on a 24 hour Face-a-thon, where we will share stories of individuals who have been helped through Living Hope and our programmes, we ask for you to like our posts, comment, share them, tag influencial people in your community, give and challenge others to give too. Like us on Facebook if you havent already by liking us here . 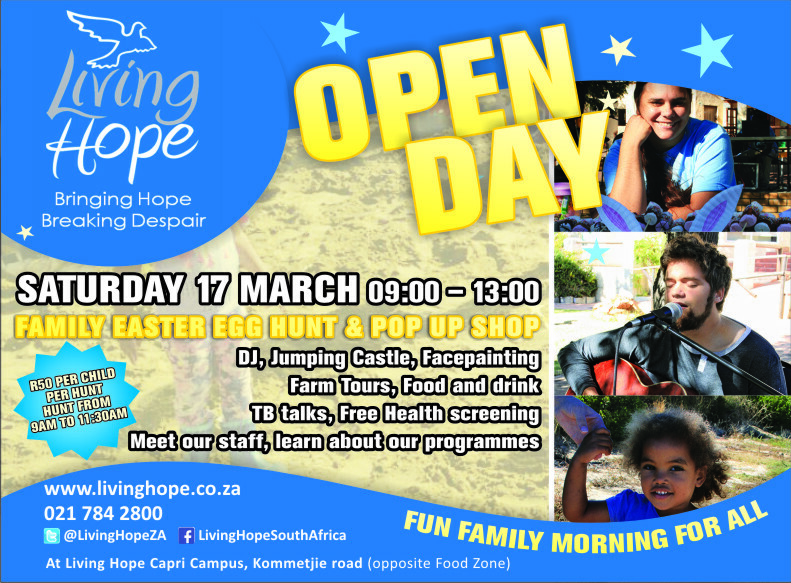 All our Cape Town friends – do come and visit the Living Hope Farm Stall and Coffee Shop at our main campus in Capri. 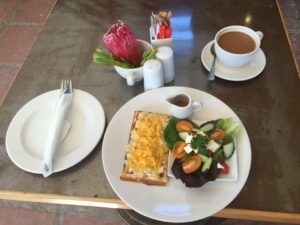 The food is fantastic and the coffee is outstanding. This is part of our endeavour to be self-sustaining and also part of our visitor’s centre which will be telling the wonderful story of Living Hope. 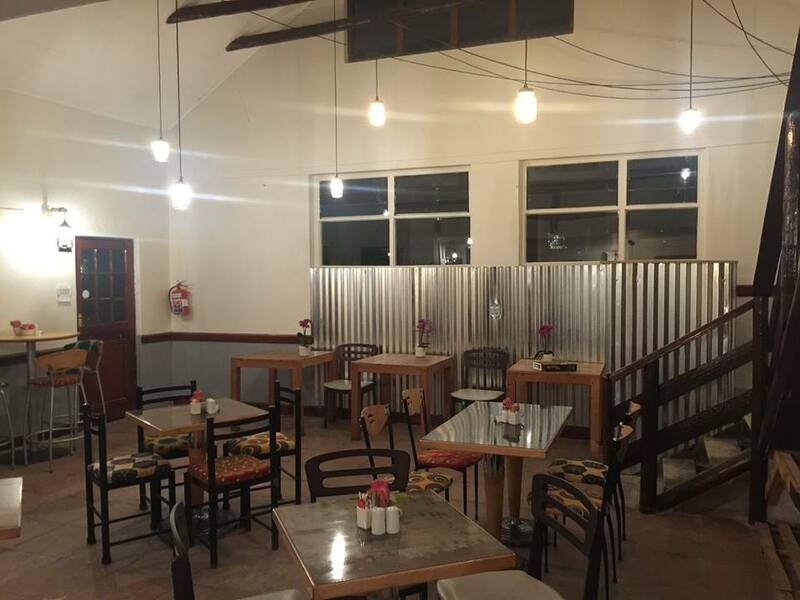 Here are a couple of our photos. Our Belgian waffles are amazing – you simply won’t find better! The Salads are extraordinary and healthy! There is lots of other nice food. 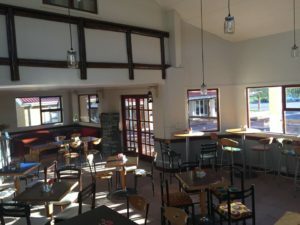 The trading hours are Monday to Friday 08:00 – 15:00 and Saturday 09:00 – 15:00.